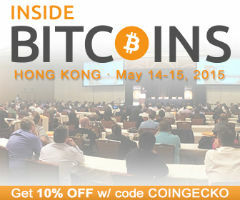 This week, I am proud to announce that we have partnered with Inside Bitcoins to provide a 10% discount off passes for next week's conference in Hong Kong when you register with the code COINGECKO. My CoinGecko partner, TM Lee will be speaking at the conference on altcoins so do attend the conference say hi to him! We've partnered with Inside Bitcoins, the world's largest bitcoin and blockchain event worldwide, as they head to Hong Kong on May 14-15. Get 10% OFF passes when you register with the code COINGECKO. New York bitcoin exchange itBit has raised $25 million in a new Series A round from investors including RRE Ventures and Liberty City Ventures and became the first company of its kind to receive a trust company charter from NYDFS. itBit is now a fully regulated bitcoin exchange and can trade nationwide. According to FinCEN, Ripple Labs failed to register as a money services business (MSB) prior to selling XRP. Additionally, the company is said to have failed to implement appropriate anti-money laundering (AML) procedures concurrent with its responsibilities as an MSB. Bitcoin core developer, Gavin Andresen has made a commit on his personal fork of the Bitcoin Core repository that will allow any block with a timestamp on or after 1 March 2016 to have a size up to 20MB. Gavin Andresen offers his side of the story on why it is very important to increase the block size from 1MB to 20MB. Michael Dean is host of the Freedom Feens podcast, but more importantly, he was one of the earliest (and loudest) advocates of Namecoin as a decentralized DNS system. In this interview, Michael offers his opinion on what went wrong with Namecoin. FinCEN's fine to Ripple Labs has huge implications for the digital currency industry especially the fact that anti-money laundering compliance must be in place from the get-go. The four biggest “pain points” these people have with the most current version of the BitLicense—the version that most in the room feared will remain intact and become final—are: that the BitLicense may regulate bitcoin wallets, not just exchanges; that the BitLicense will require money-transmitters to get two different licenses in each state; that it will require licensed companies to get approval for new rounds of funding that substantively impact controlling interests; and that it appears to also require approval for every new product they launch.